I recently had the pleasure of a short visit to Ottawa. Val joined me after the OHASSTA conference. Preparations are definitely on for Canada 150 – the 150th birthday of our country, in case you didn’t know. There’s construction everywhere – it feels like Toronto. The weather was absolutely perfect for fall and there were still some red, orange and yellow leaves. The scenery around Parliament Hill is worth the trip. We had an interesting visit to the War Museum. The special exhibit Deadly Skies – Air War, 1914 – 1918 was really informative. I learned so much about all kinds of uses of air technology in the war: balloons, zeppelins, airplanes for battle, airplanes for observation. I looked at detailed reconnaissance maps made from aerial photos. I saw how even the Red Cross got into the spirit of battle by selling little pieces of destroyed German zeppelins to raise funds. Overall, though I found it fascinating, I was saddened by the overwhelming realization of how far war pushes technology. When the war started pilots were dropping bombs out of their planes by hand. By war’s end, there were multiple types of bombs and they were massive. For my last year’s grade 12 students who inquired into “was World War I really a world war?”, I’d like to report that the air war actually began in the Far East when Japan bombed the warships at port in the German territory of Tsingtao in China in 1914. A word about the architecture of the War Museum: it is meant to throw you off somewhat, but I felt it to the maximum. I had to leave after spending too much time in its bunker-like lower level where all the tanks, trucks, and artillery pieces are kept. While we were there they were setting up for a Habitat for Humanity gala. Quite the incongruous setting. They called it ‘Steel Toes and Stilettos.” Well, I’m sure they raised a lot of money for a good cause. Auction from Habitat’s 2015 gala. Hallway leading downwards to lower hall in War Museum. Having spent a lot of time photographing the National Gallery from the outside on Saturday, we made it in on Sunday. It’s a beautiful building, but once again, I found that I reacted negatively to all the concrete. On the plus side, we enjoyed the Toronto-centric exhibit Cutline: The Photography Archives of the Globe and Mail (that national newspaper). This photo shows the proposed extension of Eglinton Avenue east of Brentcliffe Road. My mom should appreciate this – her new condo complex is located approximately where the CPR line meets the extension. Of course this photo is pre-Inn on the Park (opened 1963) as well as pre-condo (2004). The two streets of houses north of the extension appear to be Thursfield Crescent and Rykert Crescent. 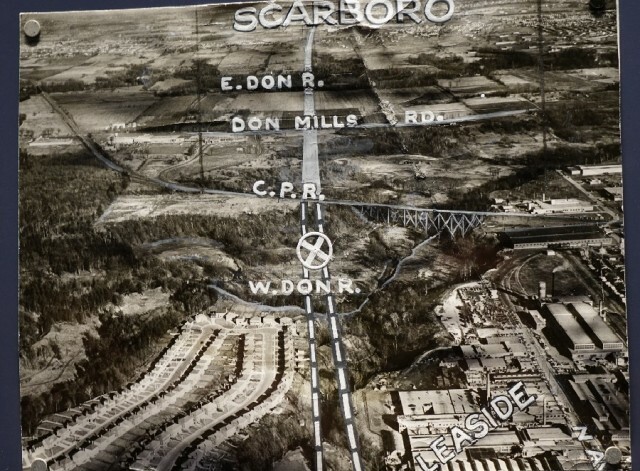 The western portion of the extension was actually built in 1956, according to https://en.wikipedia.org/wiki/Eglinton_Avenue. Val keeps saying he’d like to return to Ottawa in the summer some day. I don’t think next July 1st, 2017 will be a good time – it’s apparently booked up already! 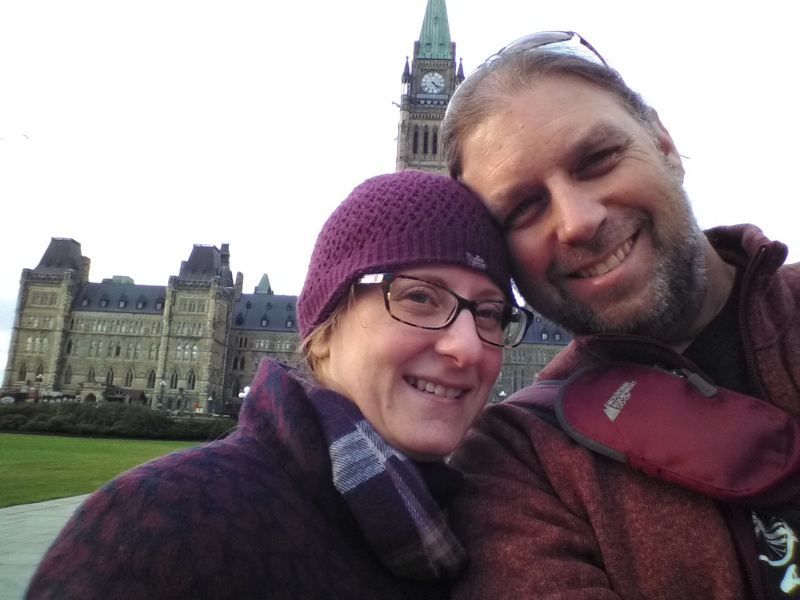 I recently visited Ottawa as well, but it was a quick trip as I was only there for a of couple days. My reason for the trip was to visit universities, specifically the University of Ottawa and Carleton University. I noticed that throughout the trip, you tended to enjoy aspects of the museum that reminded you of Toronto- your home. When I was visiting university campuses, I did the exact same thing- gravitated towards aspects of the university that reminded me of Toronto. I liked University of Ottawa significantly more than Carleton specifically because I enjoyed the downtown feel of UofOttawa that felt like the busy sidewalks and streets of Toronto. Carleton is not in the downtown core and felt too secluded for me, especially because I am someone who enjoys city life. 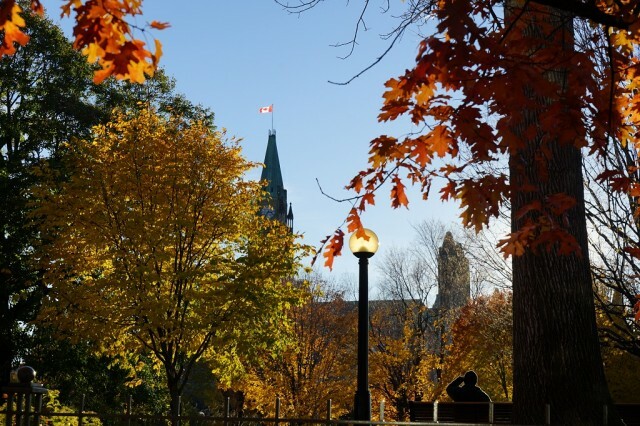 Ottawa is a beautiful city, but wherever I went, I found myself making comparisons to Toronto. As a creature of habit, I know that the transition from life in Toronto to life at university is going to be challenging for me, but necessary. As I am most probably going to go to Ottawa for university, I will make it a point to visit the War Museum! I visited Ottawa two years ago with my family and their friends. I believe I stayed at Ottawa for three to four days at that that time. The picture that you took of the Parliament reminded me of my visit to a park near the parliament(we might’ve went to the same place). I still remember that there was a beautiful church or some kinda of religious institution right beside the park I visited. I am pretty sure I made my visit during the Winter, so I was there most likely around March. I remember waiting around an extremely warm oil/fire fountain at the entrance of the Parliament to get away from the cold. My first visit to Ottawa was back in Middle School, but I don’t recall any amazing experiences from my memory most likely because everything was so rushed. I find it harder to enjoy a trip when you are in a hurry or a packed schedule. I really enjoyed the trip to Ottawa two years ago; it’ll surely be somewhere I’ll want to visit again. I’ve been to Ottawa a couple times and it has a really nice Canadian feel, just walking around and looking at the nice buildings. I remember I went there for our grade 6 graduation trip, and I recognize that exact curving hallway of the War Museum that you took in the photo. I really liked the interactiveness of that museum and I found it really fun and informative at the same time. I remember me and my friends got in trouble for trying to climb into a tank! Of course, we also went to see the Parliament buildings, Sussex Dr.,the Governor General’s house, and some churches. Every time I visit, I tell myself Ottawa is a place I’d like to live when I’m older- not too busy, but not in the middle of nowhere either. I especially love the buildings and how they’re so picturesque! I’m hoping to visit sometime this year for Canada’s 150th.